Guizhou, a mountainous region in southwestern China, features a kaleidoscopic range of natural beauty, from canyons to hot springs, karst caves and forests. Guizhou enjoys an agreeable temperature all year round, and Guiyang, the province's capital, has earned itself a reputation as China's number one summer hotspot. In this mystical wonderland that houses 17 different ethnic minority groups, including the Miao, Bouyi, Dong, Zhuang, Yao and Bai, visitors will be captivated by the area's authentic and fascinating cultures. 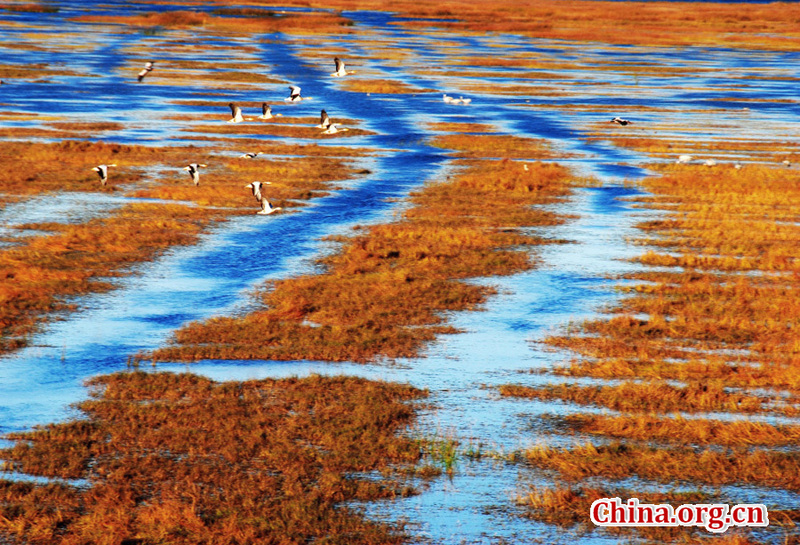 The lake is the largest overwintering site for migratory birds in southwestern China and one of the world's top 10 highland wetlands for bird observation. The lake is a real paradise for bird watchers, being home to over 180 species, including over 70 rare ones, such as the Black-necked Crane, Black Stork, and Hooded Crane. Black-necked Cranes are the only plateau crane in the world, considerably beautiful but highly endangered.Caohai Lake, a state-level natural reserve located in the western suburbs of Weining County, is the largest fresh water lake and the largest highland wetland in Guizhou. It's as famous as Qinghai Lake in Qinghai, and Dianchi Lake in Yunnan. Covering a water area of more than 30 square kilometers, the tranquil and beautiful lake is dubbed "The Pearl on Guizhou Plateau". The lake, surrounded by mountains, is well-known for crystal-clear water and lush grass growing at the bottom. The natural scenery here is absolutely amazing in springtime, when the azaleas around the lake are at their brightest and the water plants are in full blossom, dotting the lake with yellow, red and white flowers. The lake offers particularly wonderful views to visitors arriving here between December and late March, when over 100,000 birds fly across the world to spend their winter here. How to get there: You can take a taxi from Weining County to Caohai, or walk there for about 30 minutes.